The history of baseball’s statistical movement can be told in terms of Ichiro. Step by step, the numbers have gotten more granular, drilling down deeper into the sport’s bedrock. And each time they strike a new stratum, some formerly unknown aspect of Ichiro is revealed. Traditional stats taught us to appreciate Ichiro’s extreme singles hitting. After that came complex projection systems, which were forced to evolve by the confounding effect of Ichiro’s unsinkable average. Later, easy access to pitch-by-pitch outcomes enabled us to tell that Ichiro, unlike most hitters, showed a real ability to foul off pitches at a higher rate once he got to two strikes. And once we were able to look up pitch locations, we could confirm that Ichiro would swing at (and make contact with) almost anything. Batted-ball stats told us about his unsurpassed infield-hit rate, which was aided by an unmatched ability to hide hits inside opponents’ jerseys. And when we got our first taste of hit-tracking technology, the results suggested that Ichiro had an unusual ability to aim his hits at open ground, just as he’d claimed he could in 2002. HITf/x also revealed that while many hitters show a clear preference for letting balls travel deep in the zone or hitting them far out in front of the plate, Ichiro varied his stroke depending on the pitch. Even his hats were weird. It’s been a while since the last Ichiro epiphany, but the cipher is still playing. Over the weekend, Marlins president of baseball operations Michael Hill told Joel Sherman that the team is “very pleased with the job [Ichiro has] done” in 2015, and that he anticipates “trying to bring him back.” The vote of confidence wasn’t supported by the stats. Ichiro still plays good defense, but he no longer hits for a high average or ranks among the league leaders in baserunning value, which were his only elite offensive contributions. Stripped of those standout skills, Ichiro has been one of the worst hitters to earn extended playing time this season, a .237/.291/.290 slasher and a replacement-level player overall. He’s still an outlier, but only in the sense that he’s lasted so long: He’s the oldest position player in the major leagues, and he’s also the only position player from the Marlins’ Opening Day lineup who hasn’t been demoted or missed time with an injury. For most of this season — save, perhaps, for the day when he passed Ty Cobb in professional hits — it’s looked like we were past the era of awesome Ichiro stats, fresh out of graphs with way-out-there circles that stood for him. All that remained was the depressing slog to his 3,000th major league hit, which is still 67 mostly singles away. But baseball stats have become more sophisticated this season, which must mean that another insight into Ichiro awaits. Thanks to Statcast’s installation in every MLB park this season, we’ve learned about pitches’ perceived velocity and spin rate. We’ve begun to assess batted-ball speed, and we’ve seen video of the nuts and bolts behind breathtaking defensive plays. But we’ve yet to see many breakdowns of baserunning. With an assist from Ichiro, we can dip a toe into this topic, focusing on leads from first base. I asked for a few pieces of information from MLB Advanced Media: first, the average length (in feet) of the primary and secondary leads each runner has taken from first base this season, excluding certain situations1 and subdivided by the handedness of the pitcher and whether the lead was preceded by a pickoff attempt during the same time on base. Second, the average length of the primary leads allowed by each pitcher, with the same restrictions applied. And third, the average top speed (in miles per hour) of each runner on his transits from first to second, excluding foul balls, 3-2-and-two-outs scenarios, and cases in which the base ahead was occupied. Sure enough, Lester has allowed the longest primary leads, on average. As predictable as it is to see him on top of the table, though, the gap between Lester and his closest competition is much wider than I’d imagined. Most neighboring pitchers are separated by tiny fractions of an inch, but leads against Lester are almost 7 inches longer than leads against the second-place pitcher, A.J. Ramos. That’s as large as the difference between Ramos and the 84th-ranked qualifier, Grantland contributor Burke Badenhop. Leads against Lester are in a league of their own. “With a guy like Lester, you can take half the cut,” says former major leaguer Cliff Floyd, who retired with 148 steals. Statcast tracks leads and speeds from the runner’s perspective, too. 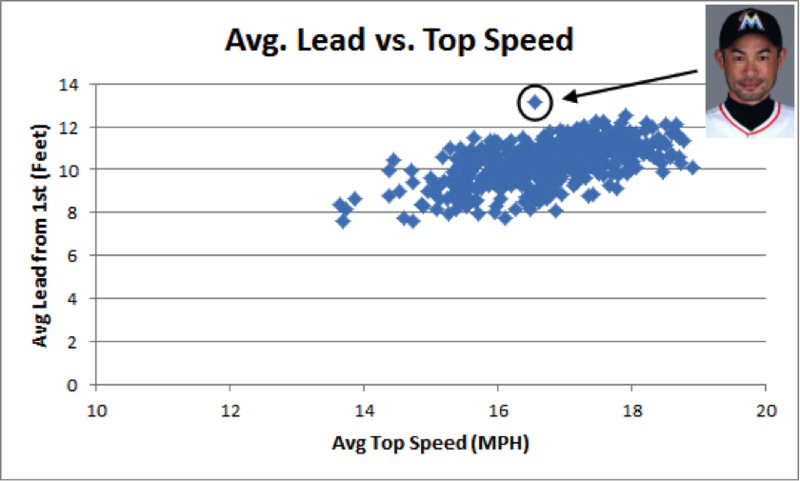 The following table displays the fastest and slowest average top speeds of runners tracked from first to second, using the same cutoff of at least 70 leads. Earlier this month, A-Rod called himself “the slowest man in baseball,” which is true in terms of average top speed from first to second. It’s obvious that the averages are picking up real differences in speed: Hamilton and Orlando are among the fastest (with Mike Trout just missing), and Prince Fielder and David Ortiz are among the slowest (with Billy Butler just missing), which passes the smell test. There’s a 0.61 correlation between average top speed and Speed Score (a Bill James–developed metric that tries to estimate player speed using various statistical clues), which signifies that the two tend to move in tandem. Which brings us back to Ichiro. The 41-year-old’s average top speed between first and second is an unremarkable 16.65 mph, likely down from what it was in his prime. But his primary leads are something special. Of all the outlier-Ichiro stats, this might be the most amazing: Ichiro, baseball’s oldest position player, takes the game’s longest primary leads from first base. Not by a small amount, either: Ichiro’s average primary lead is more than 7 inches longer than Charlie Blackmon’s. In theory, Ichiro should be the perfect person to exploit Lester’s best-known weakness. Unfortunately, Ichiro didn’t have a base open ahead of him the one time he reached first against Lester this season, but he did steal second easily against him on August 18, 2012. If we could add in an age adjustment, Ichiro would vault to the top. His physical skills are much diminished, but he’s still making the most of whatever talent remains. And that’s why it almost makes sense that Miami would consider bringing him back, despite his ugly on-base and slugging: Even at 42, Ichiro’s wizardry won’t have worn off. And if the Marlins are lucky, it might keep rubbing off on others. The averages include all recorded cases of a lead with no runner on second and a score differential of five runs or fewer, and exclude 3-2-and-two-outs situations and any leads shorter than 6 feet or longer than 15 feet.